Tokyo ​came away with little more than vague promises during the talk. Japan's foreign minister met China's top leadership on Sunday for rare diplomatic talks that ended with mutual vows to improve their chilly ties but little in the way of concrete proposals. The world's second and third largest economies have a fraught relationship, held back by longstanding disputes over maritime claims and Japan's wartime legacy. Taro Kono's visit to China was the first by a Japanese foreign minister in nearly two years and comes as Tokyo pushes for a visit from Chinese president Xi Jinping. 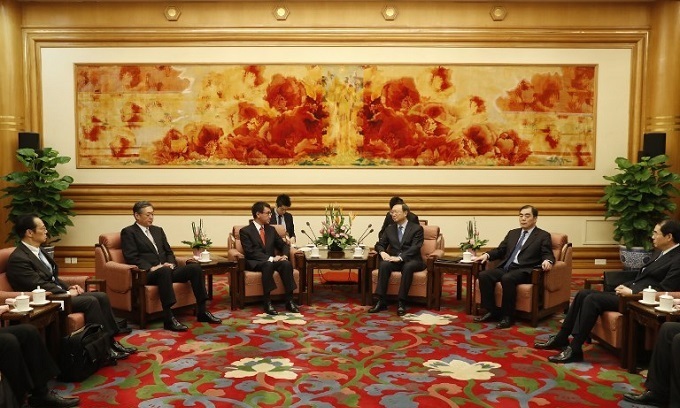 Japan's top envoy met with his counterpart Wang Yi, top diplomat Yang Jiechi and Premier Li Keqiang. But on a range of issues - from developing a military hotline to easing tensions around disputed islands in the East China Sea and to a state visit - Kono came away with little more than vague promises. In statements and remarks after the talks both Japan and China said they would move towards setting up a military hotline to avoid clashes in the East China Sea and would aim to hold trilateral talks with South Korea. Japan and South Korea, rattled by North Korea's repeated missile tests, are keen to enlist support from Beijing in halting Pyongyang's nuclear ambitions. "The North Korea issue is now an urgent issue for the whole of international society," Kono said ahead of talks as he praised progress made in the relationship between the two neighbors. A statement from China's foreign ministry listed a handful of modest accomplishments from the talks, including an agreement to avoid double pension payments for those working in each other's countries. Both sides also pledged to sign an agreement "as soon as possible" to establish a military hotline to help prevent incidents in the East China Sea. Frequent maritime patrols by both countries around disputed islets have long been a potential flashpoint and a major impediment to improved relations. But Japanese foreign ministry spokesman Norio Maruyama conceded that the two countries had yet to agree on a timeline for implementing the concept, which has been under discussion for years. A trilateral summit between the two countries and South Korea was scheduled for last December, but was postponed after the impeachment of the then-South Korean president Park Geun-Hye. Maruyama said there was still no clear timeline for when the talks might take place. "It's not so easy," he told reporters. "When we have to manage a very busy schedule among the three leaders... it's extremely complicated." Tokyo has been wooing China with official visits and business delegations, but an exchange of state visits has remained a hard sell. Maruyama said much would depend on the success of the summit with South Korea, which Japan hopes to host. If it comes together, Li would lead the Chinese delegation, setting up the possibility of an Abe visit to China and then, eventually, a visit by Xi to Japan, he said. In his meeting with Kono, Li noted the positive trend in Sino-Japanese ties, but emphasized the "relations are still confronted with uncertainties," according to China's official Xinhua news service. Earlier in the day, Wang told Kono the two countries were at a "crucial stage" in their relationship, adding "there is positive progress, but many disturbances and obstacles remain". A longstanding dispute over islands in the East China Sea - known as the "Senkakus" in Japanese and the "Diaoyu" by the Chinese - remains a source of tension. Tokyo's decision to "nationalize" some of the islets in 2012 led to a major falling out and the relationship has been slow to recover. Chinese coastguard vessels routinely travel around the disputed islands, a practice that has brought regular objections from Japan, which controls the region.